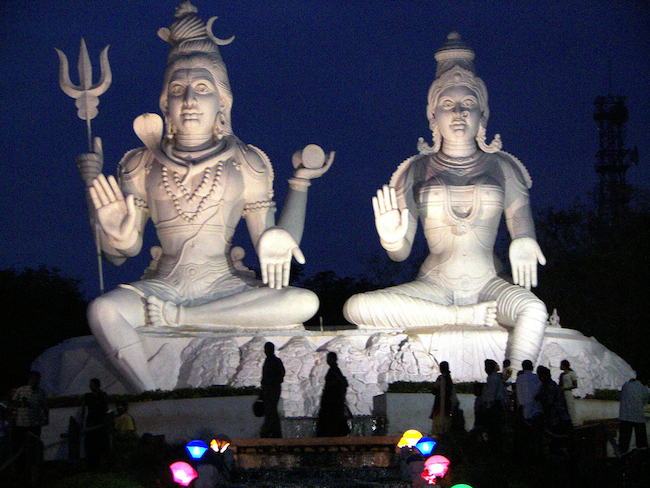 Lord Shiva & Parvathi. Photo by klachak via Flickr CCL. When Parvathi got to know of this, she became inconsolable with grief and anger. To appease her, Shiva ordered his men to come back with the first head they could find; so they came back with an elephant head. This became Ganesh, also called Ganapathi, Pillaiyar or Vinayaka. 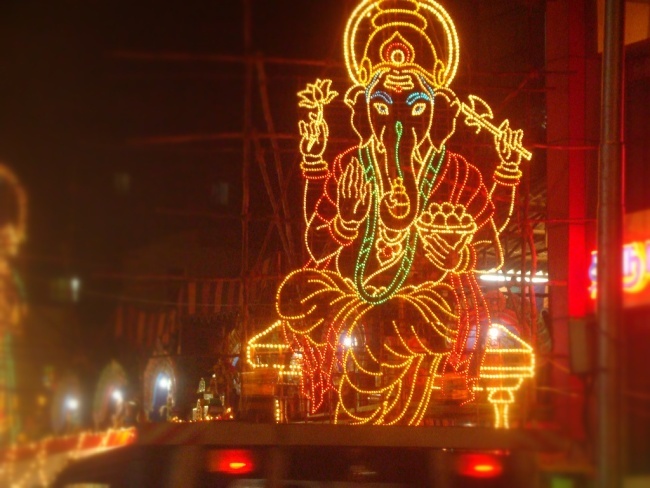 How is Ganesh Chathurthi celebrated? The preparations for this festival starts a couple of months before the festival. Huge statues of Ganesha in various poses are created out of clay; these can be anywhere between 10 feet and 100 feet in height. On the day of the festival, these statues are erected under colorful umbrellas in special platforms built for the occasion and decorated with flowers and streaming lights. In Mumbai, every locality has its own Ganesha and there’s often intense competition on who has the grandest or biggest statue. Special prayers are performed by priests. Millions are spent on these stage decorations and festival arrangements; free food is distributed after the prayers as Prasad (holy offering). As this is a community festival, there is of course music, dance and performances in praise of the deity. 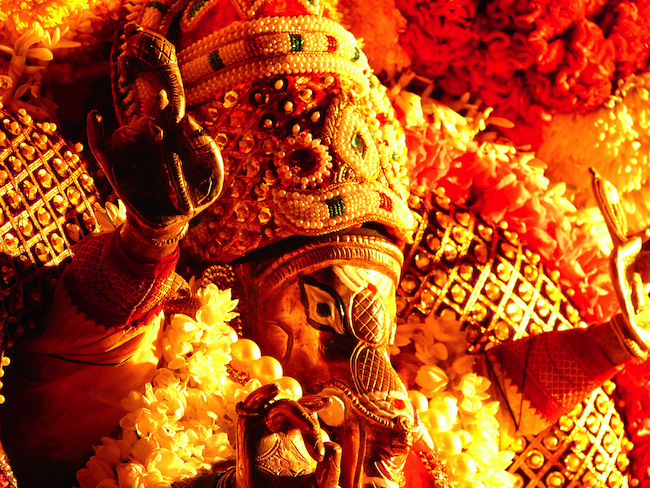 Vinayaka Chaturthi festival by Dilip Muralidaran via Flickr CCL. On the final day of the festival, these huge idols are taken to seas or rivers and immersed there; when the clay dissolves in the water, it is said that the God has gone back to his mother Parvathi. This is an important feature of this festival; the processions that take the statues through the town to the sea can get quite chaotic. Loud cries of “Ganapathi Bappa Morya” fill the scene when the idols are immersed in water; this means, “farewell Lord Ganapathi, come back soon next year!”. Lord Ganesha is said to have an elephantine appetite; so on Ganesh Chathurthi, a variety of dishes like laddoos, modaks, flattened rice, sundal, kheers, vadas and appams are prepared and offered along with fruits and coconuts. 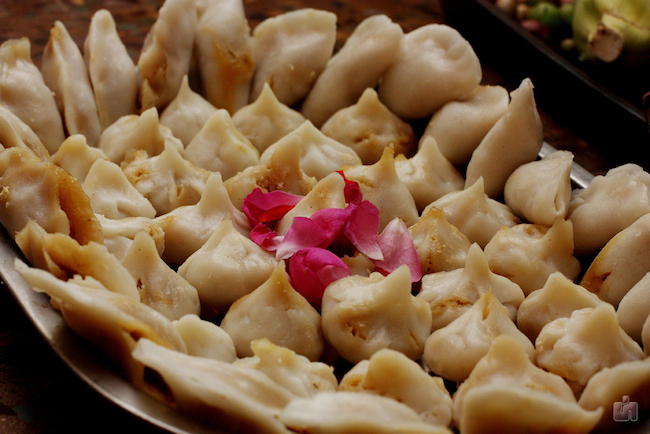 Party platter of modaks. Photo by Sudhamshu via Flickr CCL. No wonder festivals are so much fun! Note: This post is brought to you in partnership with PerpetualExplorer.com.